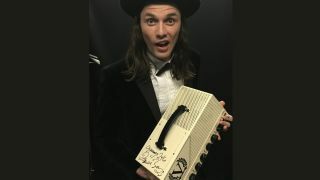 As well as being a multi-Brit award-winning solo artist, canny songwriter and ace guitarist, James Bay is a thoroughly nice bloke indeed, as he's put a one-of-a-kind signed Victory V40 up for auction to benefit the Teenage Cancer Trust. Victory's V40 'The Duchess' is a quality single-channel valve amp, but this particular model was used during James's performance at the Grammys earlier this year with Tori Kelly, making it a rare piece indeed. You can bid on the hand-signed amp on eBay, ending on 13 March - all proceeds from the sale of the head will go directly to the Teenage Cancer Trust, to support young people between 13 and 24 diagnosed with cancer. For more information, visit the Teenage Cancer Trust website.